Minnie Mouse, lesser known as Minerva Mouse, has been on the Disney scene since 1928. Walt Disney and Ub lwerks needed a replacement for Oswald the Lucky Rabbit and their new star Mickey Mouse wasn’t enough to fill that void all by himself, so it was determined he needed a love interest. It is never clear whether Mickey and Minnie are dating, married, or if he is just trying to win her affection, but their relationship changed throughout the decades. Her role opposite Mickey has also wavered from an independent woman to a damsel in distress, and back to a stronger female character in later years as she became increasingly popular. Early on, Minnie was designed like a typical 1920s fashionista. She had her flapper dress, patched knickers, black stockings, and her over-sized heels. We can’t forget her iconic bowler hat with the flower! Minnie doesn’t quite look like that today, and she has had an assortment of physical changes to accompany the changing styles. If you're wondering, "what does Minnie Mouse look like now", keep reading through the infographic until you reach the present! In fact, since Minnie has been drawn in comics, appears in animated shorts, television shows, and so much more, she has been estimated to have over a hundred outfits. That’s every girl’s dream! 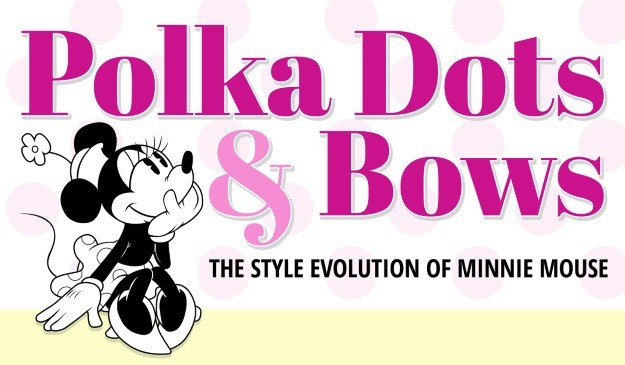 You can see the most major changes below, in our style evolution infographic of Miss Minnie Mouse! Minnie has had a lot of wardrobe changes throughout the years! What Minnie Mouse style do you like best? Tell us in the comments below. In the meantime, if you are searching for a Halloween idea and you love Minnie half as much as we do, head on over to find a Minnie Mouse costume for the occasion!